The Mountain View retirement community recognizes the hard work of local first responders every year with a block party. First Responders Block Party. 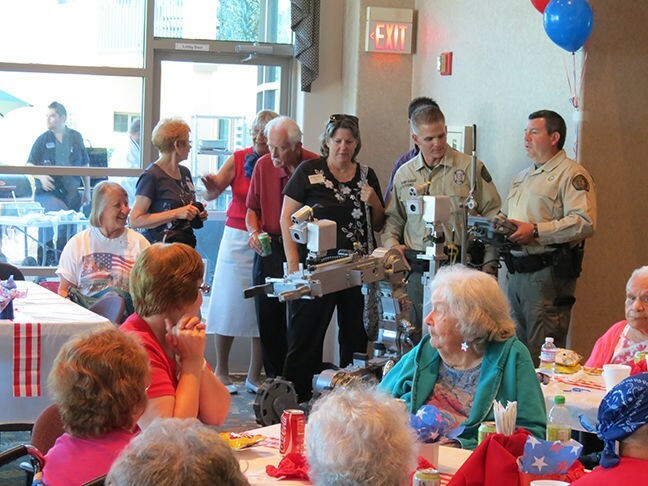 Mountain View Retirement Village is hosting their seventh annual First Responders Appreciation Block Party to honor those that put their lives at risk to save others. Guest speakers at the event will include Oro Valley Mayor Satish Hiremath, Pima County Sheriff Mark Napier and Golder Ranch Fire Chief Randy Karrer. Also in attendance will be the Oro Valley K-9 Unit (dogs!) and the Pima County SWAT and Bomb Squad, members of Border Patrol and the Golder Ranch Fire Department's ladder trucks (trucks!). The event works to honor those who gave their lives in New York during the tragic events of 9/11, and to celebrate the first responders that keep our communities safe. The event runs from 11:30 a.m. to 1 p.m. at 7900 N. La Canada Drive and is open to the public. Details here. JPride Pound Workout. Let’s start with a few definitions: JPride is a program sponsored by the Tucson J which began in 2005 with the goal of promoting inclusivity for the LGBTQ+ community. The Pound workout is a growing type of group fitness class that combines cardio, strength training and lots and lots of sweating. So, in attending this class, you’re supporting a diversity initiative and bringing yourself one step closer to the set of abs you’ve always wanted (or at least one step closer to feeling justified in eating the plate of nachos you were going to eat tonight anyway). Every second Tuesday of the month. All ages, abilities, identities, genders, sizes and faiths are welcome! 6:30 to 7:30 p.m. Tuesday, Sept. 11. Tucson Jewish Community Center, 3800 E. River Road. Free. Details here. Token Tuesday. Every Tuesday night you have the chance to finally level up in that game you just can't beat. The deal is this: free tokens with every drink purchase. So, it all makes sense right? The more you drink the better at gaming you get, therefore you will beat the game! Basic logic. So head on over to Cobra Arcade Bar and plug in. Event runs from 4 to 7 p.m. at 63 E. Congress. Details here. Events compiled by Emily Dieckman, B.S. Eliot, Ava Garcia and Jeff Gardner.